LEONE, American Samoa (CNN) -- Another earthquake struck Wednesday near the Samoan islands, an area already devastated by earthquake and tsunami damage which killed more than 130 people. A traditional Samoan fale is destroyed Wednesday in the devastated village of Leone. The 5.5-magnitude earthquake occurred at 6:13 p.m. Wednesday evening (1:13 a.m. Thursday ET), according to the U.S. Geological Survey. The quake's epicenter was 10 km (6 miles) deep in the Pacific Ocean about 121 miles (194 km) from the city of Apia, Samoa. The quake did not trigger a tsunami warning, according to the Pacific Tsunami Warning Center. It followed an 8.0-magnitude earthquake which hit the small cluster of Samoan islands early Tuesday triggering a tsunami. 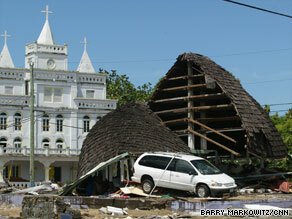 At least 139 people are confirmed dead as a consequence of Tuesday's quake and tsunami. They include 22 people killed in American Samoa, 110 in Samoa and seven in Tonga, according to officials on the islands. Survivors like Ropati Opa were trying to find ways to cope. The massive waves had destroyed his home, store and gas station in the village of Leone on the southwest coast of American Samoa. Journalist Jeff DePonte contributed to this report.